Review: Written by Joe Kelly & based on his story published as "What's So Funny About Truth, Justice and the American Way? 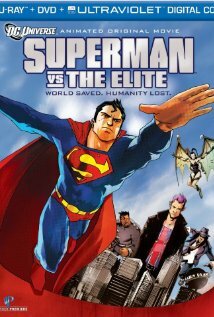 ", IMO...this is the BEST of the original DC animated Superman-movies that they made so far. The story is very nicely crafted with a good script that shows what can be done with Superman to keep him relevant in today's world. It finely explores the most human & moral issues of our favorite Man of Steel & put him into a fascinating challenge against a pretty interesting & kinda unusual super villain & his gang. Though I haven't read the comics but the earlier All Star Superman movie pretty much disappointed me after hearing lots of great stuffs about the original comic but here I think they succeed mostly in terms of portraying Superman the way he's supposed to be. There's no General Zod or Lex Luthor nor it was about a particular rivalry or an origin story but still it beautifully delivered what any good super-fan wants to see in a movie. Though I'm not a fan of Japanese Anime sort of artwork for any American superhero animated-movie treatment but it didn't bother me much this time, cause the voice actors did a great job & mainly the story & script was surprisingly too good for a DC animated film.